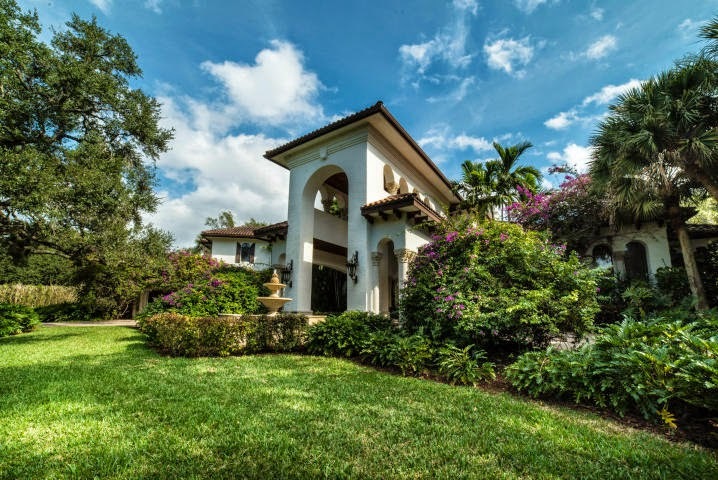 This spectacular Foxe Chase estate home was recently listed in the beautiful Delray Beach Florida. This exquisite Mediterranean style home features incredible high-end finishes throughout and includes 5 bedrooms, 6 full bathrooms, 2 ½ baths, and a 3 car garage all on over an acre of heavily landscaped perfection. The minute you enter this home you are surrounded by jaw dropping features like soaring ceilings, pristine wood treatments, elegant stained glass windows in the stairwell and master bath, luxurious French doors to the resort inspired backyard and over-sized pool, a fine wood paneled study, a majestic porte-cochere with a large fountain, impact glass throughout the entire home, an opulent wine cellar with wrought iron glass doors, dual dishwashers and dual washer & dryers, and a steam shower in the master bath. Foxe Chase is a luxurious gated community filled with cascading waterfalls, a beautifully serene lake, wooded one acre home sites, and lushly landscaped homes. Foxe Chase is located within 15 minutes of the Boca Raton’s beautiful public beaches, Gumbo Limbo Nature Center, Mizner Park, or the Boca Raton Resort & Club. The city of Delray Beach is also known as a "Village By The Sea". Delray Beach is located in the Southeast corner of Palm Beach County on the Atlantic Ocean. The City of Delray Beach encompasses just over 16 square miles with a year-round population of nearly 65,000 and growing. Delray Beach residents enjoy a variety of year round recreational activities like championship golfing, hiking, fishing, swimming, biking, and yoga along with a plethora of pristine beaches, entertainment venues, world renown shopping areas and top of the line restaurants. Delray Beach is surrounded by busy towns like Miami, Ft. Lauderdale and West Palm Beach making travel easy and convenient between 3 international airports.